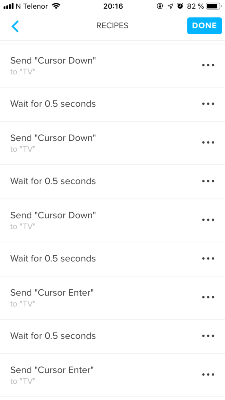 I have a very long recipe setting many settings the TV forgets when I turn it off. So I need to run this every time I start my TV. Most of the IR codes (about 30) are sent with 0.5 s delays in-between. Works perfectly most of the time. Problem is that the screen on the remote shows the recipe circle for another 30 s. Rendering the remote useless for half a minute. I believe sub second delays (0.5 s) are visualised as full second delays. The long IR recipe is complete on the TV when the Remote's recipe circle is half way. - How long does the TV take to power on until any command can be received and executed? - What's the exact make and model number of your TV? Also, make sure to add the manual steps for the TV settings after the Power on command and the delay following after the Power command. Andy Apologies for the delay in response. I have not been aware that you responded to this topic. My TV is Samsung UE55F8005. There is nothing wrong with the timing turning on the TV. My issue is after the TV has started. I have to run a very long recipe setting configurations that the TV forgets at boot. I have created a separate recipe that I run independently when the time is right. My recipe has roughly 60 steps and every second of them is a 0.5 second delay. However, the circle does not complete for another 30 seconds after all the commands have been sent. I.e. about twice the time to actually send the IR commands. It leads me to think that the minimum visualisation of the circle is 1 second per delay - even if the actual delay is half a second. There may be a rounding error or something similar. The problem remains in the latest version of the firmware. Can you please send me a screenshot of the "configurations" recipe? Thanks! Another very late response. Issue still present. Here are a few screenshots of the recipe and a video of the execution in front of the television where you can see that the wheel does not match with the sending of the commands. Note that most of the delays (wait for...) are of 0.5 seconds. My theory is that Neeo visualise them as 1 second. Hence, the circle uses twice the time as the command execution. See the video here: https://www.dropbox.com/s/htrj1lwy4boojvf/Neeo%20Bug.MOV?dl=0 . Thanks! I see what you mean. Can you please send me a screenshot of the complete recipe? Some commands have pre-defined delays. I want to make sure that no such command is included. Also, is it correct, that at the end of the video when the last two BACK commands are sent, they where already executed? 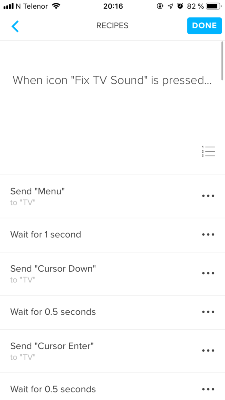 Or does NEEO actually send the commands like displayed on the remote?